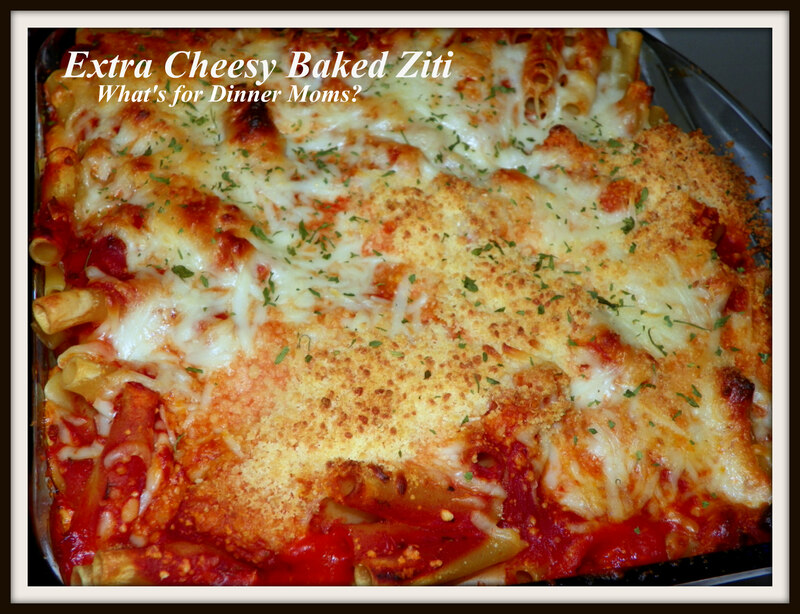 Extra Cheesy Baked Ziti – What's for Dinner Moms? We all need those dishes that we can put together really quickly and that can feed an army with less than an hours notice. This is one of those dishes for me. Back a few weeks ago I made some Spaghetti Sauce or Sunday Gravy (click for link to original recipe). It makes a huge amount and freezing some of it for nights where you need a meal quickly is really smart. Take it out of the freezer the night before or the morning you need it and place it in the refrigerator to thaw. By the time you need it you will have homemade spaghetti sauce waiting for you! Though jarred sauce will work just fine there is nothing like fresh spaghetti sauce. This is such a good simple dish. Add extra garlic or change the meats to your preference. It is pure comfort food at it’s best – cheesy, flavorful, warm to your heart. A double layer of cheese helps spread the cheese throughout the dish. I added green beans and a green side salad for a complete meal. As always to make this gluten-free use gluten-free pasta. Place a small amount of sauce in the bottom of the pan to cover it. Add 1/2 the pasta and spread over the bottom of the dish. Pour 1/2 of the sauce over the pasta. Sprinkle 1/2 of the cheese over the sauce. Add remaining pasta, then sauce and then cheese to the dish. Bake for 35-40 minutes until cheese is starting to brown and sauce is bubbly. Serve hot with Parmesan cheese for topping if desired. Yum, I think baby will like this 😊! I love the title 😀 Looks delicious! Thank you, Lynn. Have a wonderful day! Thank you so very much and thanks for stopping by! Thank you! Hope you get a chance to try it!